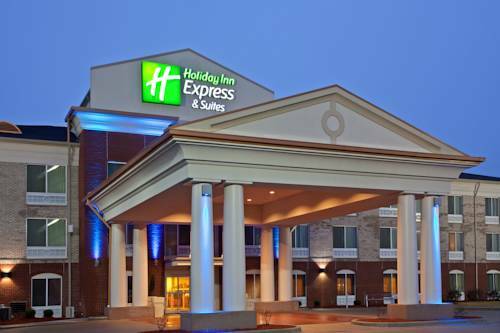 Welcome to the Holiday Inn Express Hotel & Suites in Historic Vandalia. Conveniently located off I 70, our pet friendly hotel in Vandalia, IL offers an ideal location near the Old State Capitol Building along with premium amenities to ensure you have a comfortable stay. Our Vandalia hotel provides quick access to area attractions such as the Fayette County Museum, Lakes Carlyle & Vandalia and the Madonna of the Trail Monument. Golfers can enjoy a stay at our choice Vandalia accommodations since our location is near top notch courses, like Indian Springs Golf Course, Vandalia Country Club and Ramsey Lake Golf Course, all less than 20 miles from the hotel. Business travelers looking for lodging in Vandalia, Illinois will love our hotel's close proximity to area businesses like Fayette County Hospital, Dynegy, and Exxon Mobil pipeline. Our hotel in Vandalia, Illinois offers premium business services, which include a 24 hour Business Center, free high-speed, wireless Internet access & a large meeting room with A/V equipment and catering options. While lodging at our smoke-free hotel in Vandalia, IL enjoy the first class facilities, which include a state of the art Fitness Center, a heated indoor pool and a relaxing whirlpool spa. Every morning, help yourself to a cinnamon roll from our Vandalia hotel's complimentary hot breakfast bar. Book your reservation today & Stay Smart at our Vandalia, IL Holiday Inn Express Hotel and Suites. Wood fired. Gourmet pizzas. Smoked wings. Salads and sandwiches. Desserts. Beer. Wine. Cocktails. Video Gaming. Our wood fired oven, built in Italy, fires your gourmet pizza to 900 degrees in minutes and brings out the natural flavors of every ingredient. Our Meeting room holds up to 40 people. We have available to guest a tv, projector, and drop down screen. - Thelma Keller Convention Ctr. Amtrak has railways to many major cities in the USA. Large area located on the Lake that offeres plenty of camping sites. A park is also nearby.